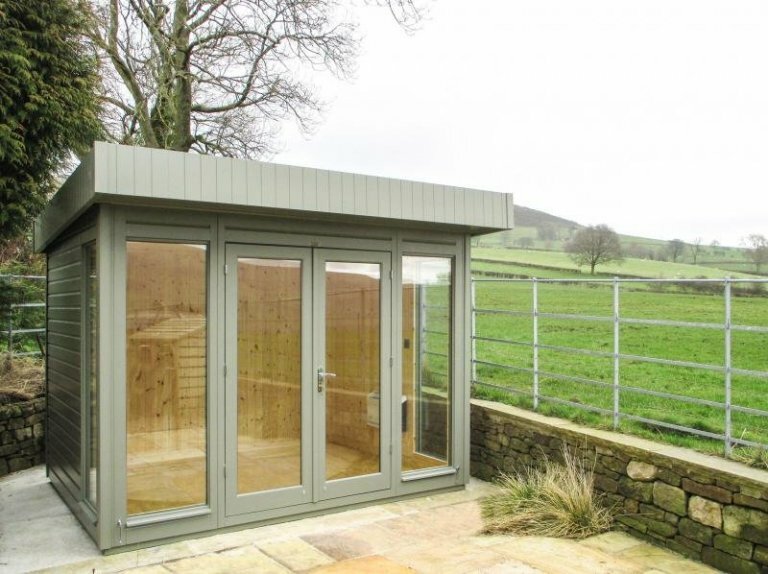 This Salthouse Studio is 2.4 x 3.0m in size, and it has been installed in our customer’s garden, facing the sheep field next to their garden, in Hope, Derbyshire to use as a comfortable relaxation spot and to enjoy the view with a good book and a cup of tea. 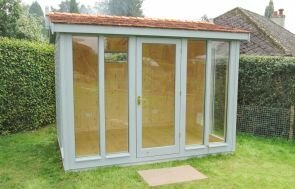 Our Salthouse Studio comes with full insulation, natural matchboard lining, and double glazing all as standard, allowing our customers to get a lot of use out of their buildings. There is also the option to add an electric pack to make it truly suited to year-round use, which is what this customer chose to do, as well as having a heater. Ash is the colour the customer chose to have their studio painted in, which is a neutral colour from our Valtti Paint Range. Due to its neutrality, and the natural matchboard lining inside, the studio blends in nicely with the garden and its surroundings. The pent roof (with heavy duty felt on), full-length glass in the windows and doors, and polished chrome door furniture all come together to create more of a modern style building than some of our other Garden Studios, Summerhouses and Garden Rooms, so if that’s what you’re looking for, the Salthouse could be a great choice for you. For more information on our range of year-round usage buildings, please call us on 01760 444229 or come and visit one of our Show Centres across the country.